Parents often find it confusing to decide that which kind of bed will be the best suitable for their children. Many purchase normal beds which adults use. You should not make that mistake when special type of beds is available for kids. Kids’ beds are designed to meet all their needs. These furnitures look attractive, feature accessories that kids like, and provide safety features that normal beds do not provide. Therefore, many parents buy kids’ beds instead of buying king or queen size beds for their children. What features make kids’ beds perfect for their comfort? Some parents might wonder that kids grow very fast and soon they will need other type of beds to sleep comfortably. That’s why many families choose to buy normal beds. Unfortunately, these beds do not provide enough safety features to keep children away from injuries. Beds with sharp corners and rough edges can become a big reason of injuries. Kids do not care about anything when they are playing in their room or outside the house. They just focus on their games and therefore injuries happen. You can avoid the chances of injuries in their bedroom by choosing special beds such as bunk beds. The modern furniture manufacturers provide kids beds equipped with multiple safety features. The chances of accidents reduce very rapidly. In addition, these beds are structured to provide additional storage, a little desk, and kids-friendly stairs. All these additional features make these beds center of attraction for the kids. The captain beds feature perfectly crafted bed frames that offer ample space for storage under the mattress. There can be space for storage or a pull-out bed for the guests. Such unique features make captain beds very useful for families with two or more children. The furniture retailers offer some great variants in this type of bed with different structures. This type of beds were used by captains on the ship, but now these are also popular in families. This bed is very beneficial for you if there is limited space in children’s bedroom and you still want to use that space to for storage or additional bed. Bunk beds are probably the most popular type of children’s bed. A bunk bed features two different but identical beds stacked in the same structure. There will be a stair to reach the upper bed whereas the space below the lower bed can be used for storage. Kids’ bunk beds come in many different designs. Some can feature a slid for getting down and some may feature a desk, rollover trundle bed or additional storage for toys, books, clothes, and other things. Bunk beds have been used by people for many decades, but today’s bunk bed designs are very unique and entertaining for the kids. 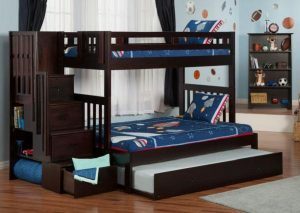 If your child is growing faster, then you should buy mid sleeper beds. A mid sleeper bed is considered ideal choice for 5+ years kids. It provides much larger mattress with many comforting features. In addition, a mid sleeper bed features a staircase to climb up because various drawers or a tiny desk is placed underneath the bed. This design is suitable for kids who are afraid of height. The bed is not placed too high above the ground so that the kid can easily climb up and down. Cabin beds are a little different from other three kinds of children’s beds because these beds offer elevated space underneath the bed. It is totally up to the kids or parents that how they want to utilize that space. You can set a study desk below the bed or place a cupboard. Having a cabin bed in kid’s bedroom allows you to have more room for decoration. If you do not want to shrink the free space, then you can leave that free space as it is. It will become a favorite spot for your kids to play with their friends or alone.